-40F to +485F ( -40C to +250C ) depending upon the ordered temp. probe. +/-1% for most temp. probe models. Digital LED Clock, UP/DOWN Timer or Thermostat for Heating or Cooling. Housing suitable for installtion in Stoves, Ranges or Panels. high power relay and/or the buzzer. 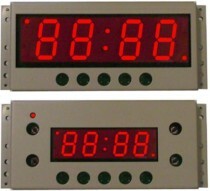 The 4-digit LED display can show time and temperature and Timer in Mibn:Sec or Hrs:Min. Available in RED, GREEN or BLUE. The time, temperature preset may be changed at any time. Optional Lithium or self-reacharging battery backup. Models available to operate in Celsius and Fahrenheit. Clock/Timer with 0 to 99 Hrs preset range. 120Vac, 50/60Hz Power Line supply. 1 Medium Power relay (10 Amp / 250V max) on-board..